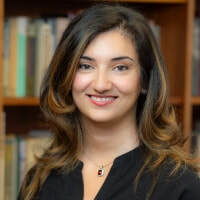 Narges Bajoghli is Assistant Professor of Middle East Studies at the School of Advanced International Studies (SAIS), Johns Hopkins University. She is an award-winning anthropologist, filmmaker, and writer. Narges' academic research is at the intersections of media, power, and military in the Middle East. Specifically, her research focuses on regime cultural producers in Iran, and is based on ethnographic research with Basij, Ansar-e Hezbollah, and Revolutionary Guard media producers. The resulting book, Iran Reframed: Anxieties of Power in the Islamic Republic, will be published by Stanford University Press in 2019. The research for this book was supported by research grants from the Social Science Research Council, the National Science Foundation (awarded/declined), The Wenner Gren Foundation for Anthropological Research, the American Institute of Iranian Studies, and NYU's Torch Fellowship. Narges received her PhD in socio-cultural anthropology from New York University, where her dissertation was awarded the Dean's Outstanding Dissertation Award in the Social Sciences. She was also trained as a documentary filmmaker in NYU's Culture and Media Program. Narges is currently working on two new research projects. For her second book project, Narges is focusing on the use and effects of chemical bombs in the Iran-Iraq war. She is the director of The Skin That Burns, a documentary film about survivors of chemical warfare in Iran, distributed by Film Media Group. The film has screened in The Hague, Hiroshima, Jaipur, Tehran, and in the U.S. (New York, New Orleans, New Jersey, Chicago, and Irvine), at festivals and university campuses. She has also directed oral history projects on survivors of chemical weapons in Iran. Narges is also working on a new film and academic project, America Held Hostage, which looks at the ways American media coverage of the Iran hostage crisis transformed U.S. news culture. In addition to her academic writing, Narges has also written for The New York Times Magazine, The Guardian, The Washington Post, Al Monitor, ​Middle East Research and Information Project (MERIP), The Huffington Post, and LobeLog. She has also appeared as a guest commentator on Iranian politics on DemocracyNow!, NPR, BBC WorldService, BBC NewsHour, and PBS NewsHour as well as in Spanish on radio across Latin America. Outside of academia, Narges was the co-founder of the non-profit organization, Iranian Alliances Across Borders (IAAB), has worked extensively with NGOs in Iran and Latin America (Cuba, Nicaragua, and Costa Rica), and has curated and organized art exhibitions and exchanges in the United States, Iran, and Cuba for two decades.